Museum archaeologists focused on the ruins of Ephesus' earliest settlement. The enclosure for archaeological remains at Ephesus elegantly reconciles historic conservation with accessibility for visitors. found during the excavations of the Temple of Artemis and other locations in Ephesus. areas of Ephesus on a flat area which has over the centuries turned into a swamp. Today one can only see the ruins of the foundations of this marvelous construction of the Hellenistic Age, entirely made of marble and full of sculptured columns' capitals and shafts. By the end of your touring, return to Kusadasi. 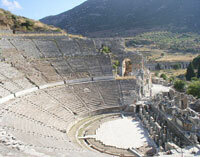 You will visit parts of Ephesus not located on the tourist route, nor seen during regular site visits. Guests are encouraged to wear comfortable shoes for this tour, which involves mostly downhill, but extensive-walking on uneven surfaces, and many steps to climb inside the terrace houses area of Ephesus. This tour is not recommended for guests with limited mobility and guests who utilize a wheelchair. Temperatures can reach extreme highs during summer months; we recommend that you drink a lot of water and use suitable sun protection. - Approximate time to reach to Ephesus Museum is 30 minutes.